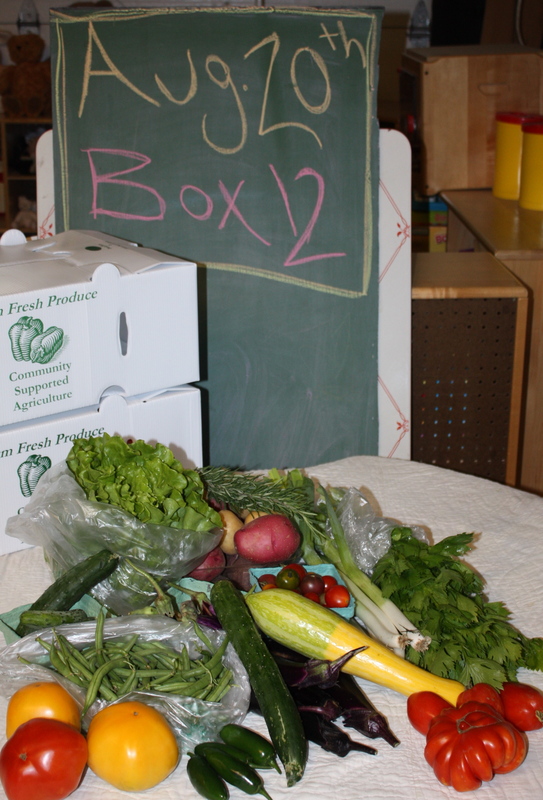 Another super box this week….it is the best season ever for us. Enjoy the bounty. Lettuce-A juicy buttercrunch this week. Leeks-We have a wonderful leek crop this year. This is the early variety with 2 more harvests to come. Potatoes-We created a nice medley this week. 6+ pounds for everyone. All 3 varieties suitable for all types of cooking. Bake, fry, steam, mash. Adirondack Blues, Carola (the buttery whites) and Red Norland. Cucumber-Snackers and Slicers-This may be the last week. Green Beans-I thought last week was it for this rotation and then we had one more harvest….the plants have been pulled so this will be it until Autumn. Summer Squash-Patty pans or assorted zucchini. Celery-Enjoy the wonderful flavor in soups and stir fry. We use the leaves on our sandwiches and salads. Rosemary-The herb of the week. Seems perfect for all those potatoes. Eggplant-I know!!!! AGAIN! I am shocked myself. We are sharing this bounty with you all…. Really we have decided that eggplant is the new zucchini around here. When oh when will it end…..
Tomatoes-The usual box of pretty cherries and all the paste and slice you wish. Jalapeño Peppers-For your weekly fresh salsa. Here’s a great recipe for the leeks, tomatoes and eggplant!